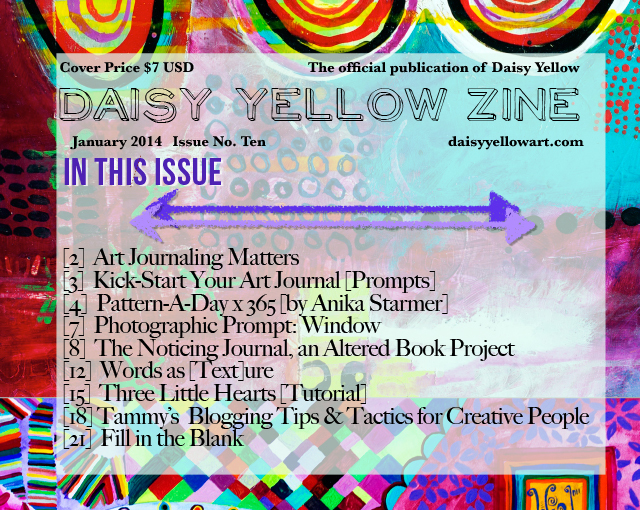 A few months ago Tammy Garcia, who blogs over at Daisy Yellow, contacted me about writing an article about my daily pattern project for the 10th issue of her zine. I was already a big fan of her blog and the challenges she hosts such as Index Card A Day and the Moments Challenge, so of course I jumped at the chance! We’ve had a lot of fun going back and forth with each other while perfecting my article. Tammy just released the issue for sale last week, and you can win a copy here on my blog, or via my Instagram. For those of you who aren’t familiar with Tammy, her blog is chock full of ideas and inspiration for creating art journal pages and mixed media art work. As I mentioned, she hosts a variety of art making challenges throughout the year, and moderates a really great Facebook group too. I recently joined DY community on Facebook, and I love seeing all the great art people post to the group. It’s all about encouraging and inspiring each other and being proud of the work you create. 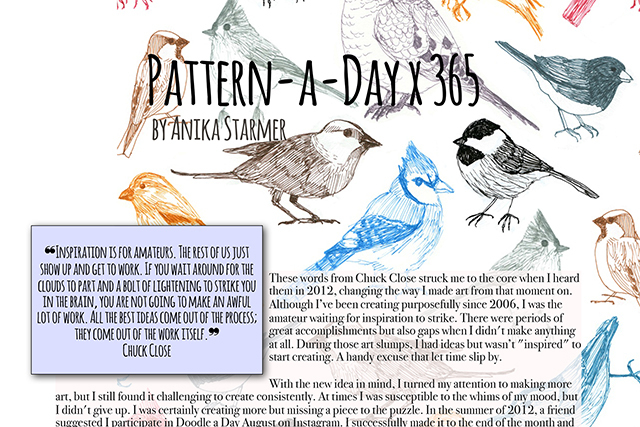 In the article I wrote for the zine, I talk about why I started the challenge, how I came up with so many different ideas, changes I made to the challenge from month to month to help me stick with it, what I learned after more than a year of creating patterns everyday, and more! My article is just one part of a zine that is, “Jam packed with ideas + inspiration.” You’ll also find art journal and photography prompts, Suggestions for altering a hard backed book for use as an art journal, a mini index card art project to try out, and even some blogging tips for creatives. Not to mention the fact that the layout and imagery throughout the pages is super lush and inspiring in its own right. I’ll be very excited for whomever wins this zine, but if you just can’t wait, you can purchase your own copy right now over on Etsy. If you want to try your luck, visit Tammy’s page that has all the info about Issue 10 and discover what you are most excited to read about–and your answer doesn’t even have to be my pattern article! 😀 Come back here to this giveaway post and leave a comment below telling me what part of the zine you can’t wait to read. Feel free to leave a comment on Tammy’s blog as well, but know that only comments left here will be counted toward the giveaway. If you have already purchased the zine and you win either this or my Instagram giveaway, Tammy has graciously offered to refund the full price of the zine back to you! I will randomly draw a name on January 31st 2014 which is next Friday (edit: I changed the date from February 1st because I was looking at the wrong calendar! The drawing will be Friday!). I’ll announce the winner here, and also send an email to the winner, so be sure to use an email address that you check frequently. You can also enter on Instagram. Make sure you follow me there, and leave a comment on one of the giveaway photos. While you’re over there, check out Tammy’s colorful photos as well! Let’s Make Patterns in February! Did February sneak up on any one else? I realized the month was changing yesterday, and was totally surprised! So this post is coming a day late, but also just in time to start a month of daily patterns in February! In months past I’ve focused on a particular medium, but I am changing it up a bit in February. 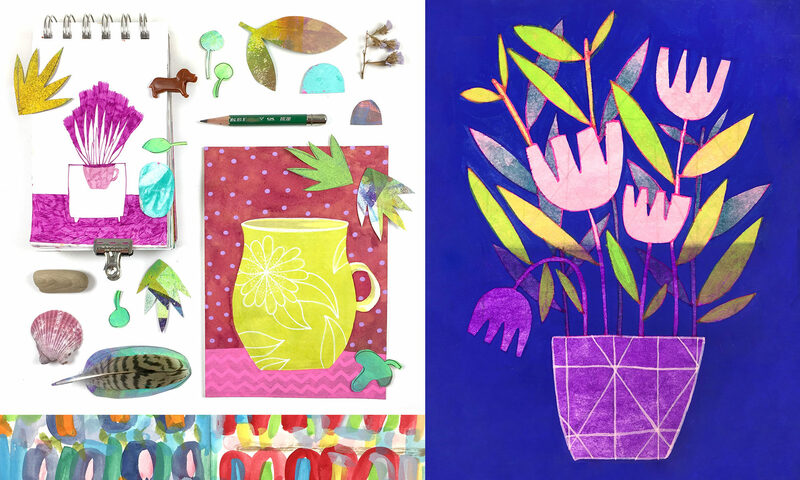 Kari Maxwell emailed me yesterday and invited me to be the guest artist for her February Creative Commitment Challenge. I couldn’t say no! My plan is to incorporate her daily prompts into my patterns in some way. She’s doing 20 prompts throughout the month. There will be some wiggle room since several days won’t have a topic, but that will give me the opportunity to explore in detail those that I particularly like. As for this month’s medium, I’ll be drawing with fine tipped markers–both zig writers and prismacolor fine liners as needed. Since I’ll be creating patterns based on Kari’s prompts, I will also incorporate other media as inspired. I’m curious to see how the patterns from February will look as a group. Will there be harmony, even if I use very different materials from day to day? Will each pattern make more sense on it’s own? I won’t be able to answer these questions til the end of the month, but I’m looking forward to the process and the insights that await! I would LOVE for you to join me this month and make a pattern every day. Any medium at any size is great–tailor this challenge to suit you, your schedule, and what you want to accomplish. There are very few set in stone rules, besides the obvious: make patterns. Even if you can’t get a pattern done every single day, I’d love to have you join the fun when you can! If you’re curious about Kari’s class, there is still time to sign up, and it would be extra fun to have you join, either creating patterns, or just creating! If you make patterns this month, be sure to tag your images with #patternadayfeb and/or #letsmakepatterns. Also add your images to the flickr group. Looking forward to another month of lovely patterns!